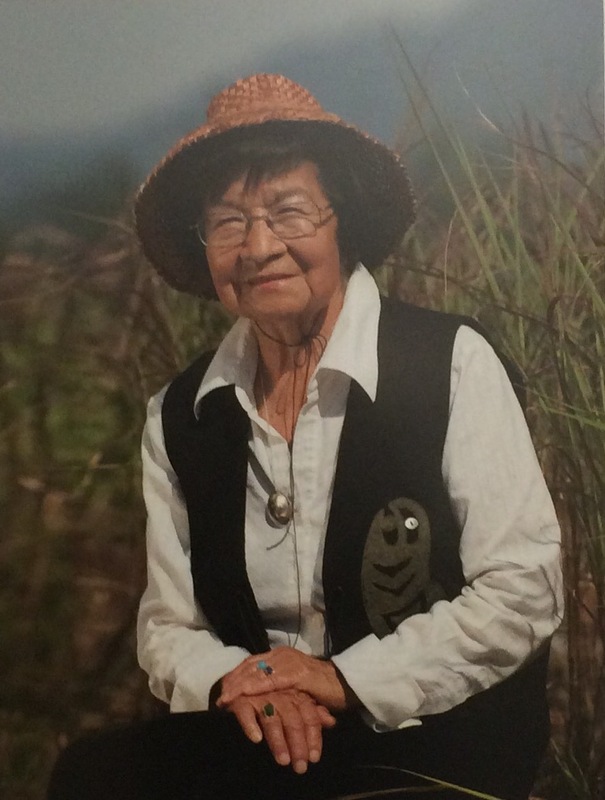 In January, I was transferred to Norma Rose Point School, located beside The University of British Columbia. My route to work now takes me along the same path I trekked along 4th Avenue with my older sister and the neighbourhood kids to Queen Mary Elementary School. The one day that I biked to NRP, confirmed that my perception as a five year old was correct in assessing that it was a REALLY big hill to get to Queen Mary Elementary School. The daily drive along memory lane has also precipitated reflections on my early school memories in the Kindergarten house at Queen Mary. Mrs. Hicks “lived” in the very welcoming Kindergarten house, an outbuilding of Queen Mary Elementary School and was immune to the dominant “cells and bells” of the Ford model of design. It had big spaces to gather, a piano with a big oval rug for singing time, a cuckoo clock to ponder the notion of time and lots of stations to build, create and experience integrated learning. I clearly remember mastering tying on the Fisher Price big shoe with laces and being able to predict how many times the bird would say cuckoo before it hit the hour. Outside the ocean was close by and the forest provided endless building materials for recess and lunch projects, although it may have “officially” been out of bounds. I do remember a hole in the fence. It was a safe and happy place to explore that had some of the comforts of home and the collaborative possibility of friends. Norma Rose Point is a rebuild on the site where University Hill Secondary School use to be. The only thing that remains from the original school is the gym, which was impressive back in the day. The visioning process for Rose Point School was led by FNI (Fielding Nair International) and they consulted with the design architects, Think Space. 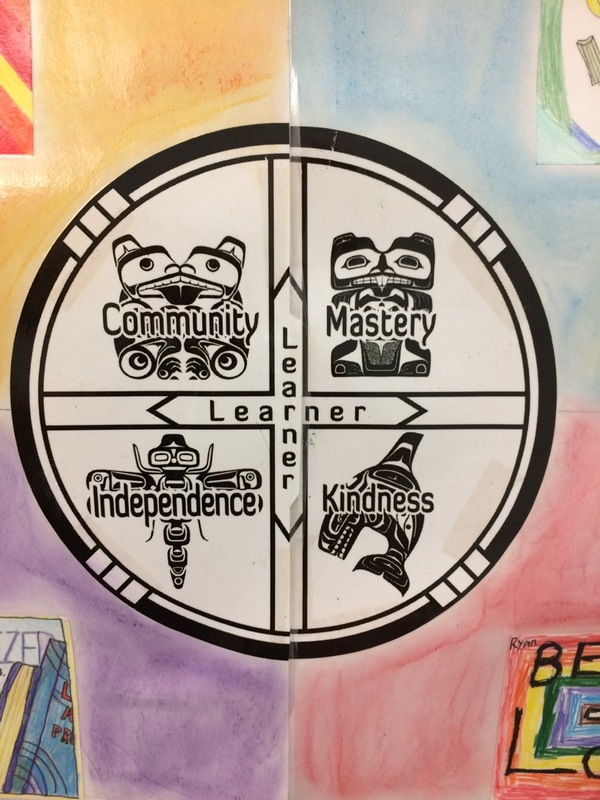 It has allowed for a collaborative, iterative experience and celebrates that the school is on Musqueam ancestral lands and a perfect conduit to facilitate understanding of indigenous ways of knowing. The building itself embodies the shift in school design. 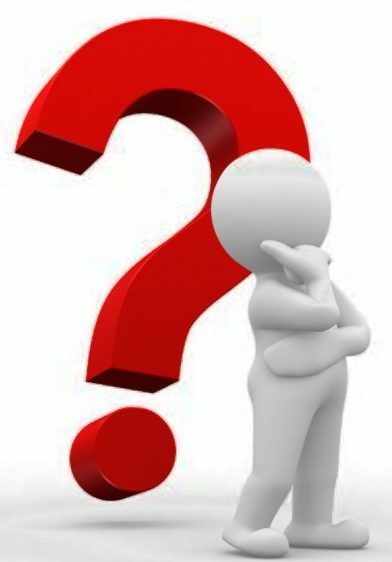 For me it has pushed the question – How does site design impact learning opportunities? When you walk into Rose Point School, the welcoming and friendly tone of the school is evident. While it is delightful, it is something I have experienced in several schools in the three districts I have worked in as an educator. It directly correlates with the strength of the relationships that the caring adults in the building have developed with the students. 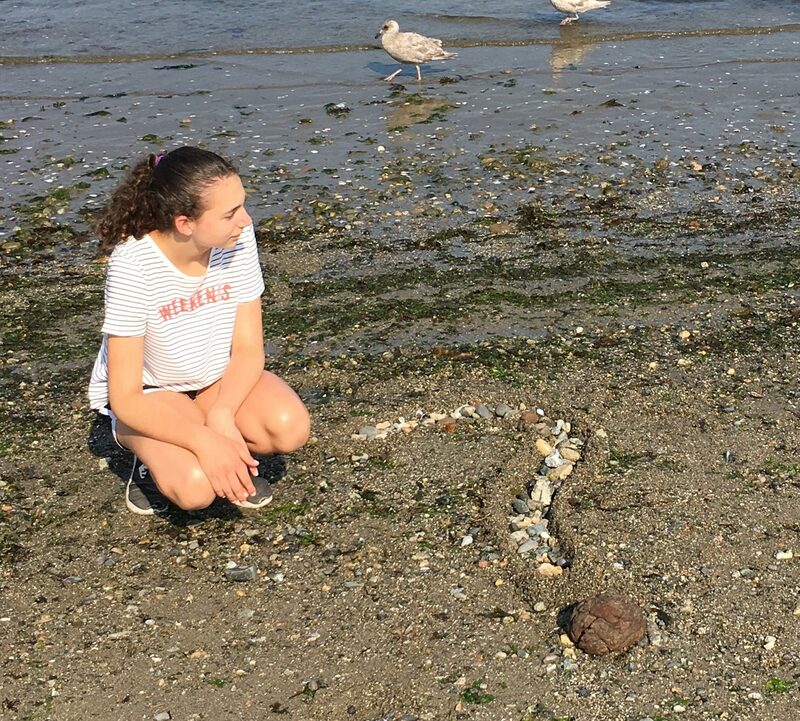 What is unique in the school, is the wide open spaces, natural light and beauty and the variety of spaces and places and ways that students are engaged in learning and their willingness to talk about it. The school mantra of “learners at the centre” is clearly understood by the students. They understand that teachers are their to support them in their learning journey rather than to simply rank them on what they are able to memorize and regurgitate on a test. 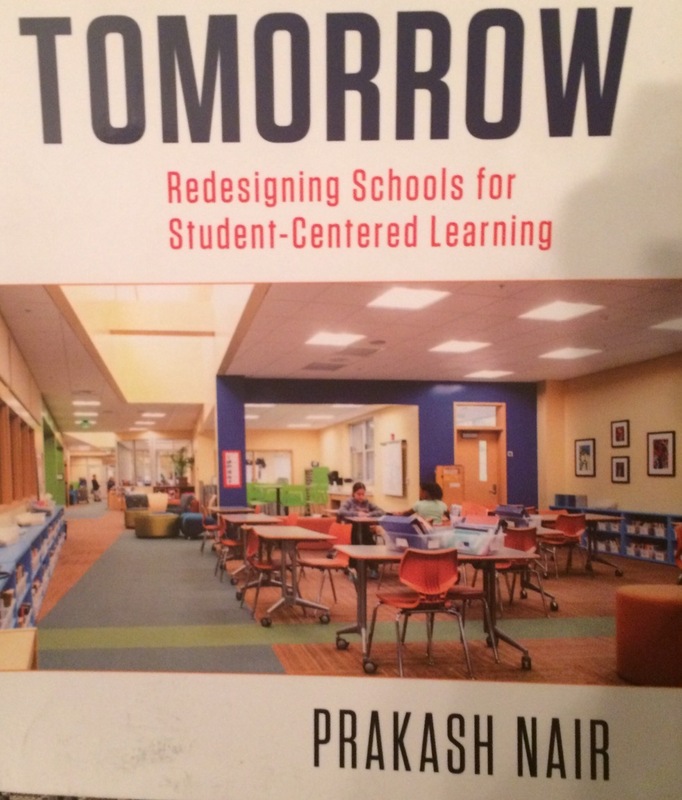 In his book Blueprint for Tomorrow: Redesigning Schools for Student-Centered Learning (2014), Prakash Nair shares the ethos that well-designed school buildings can be a catalyst for pedagogical change. 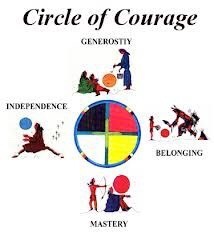 I suspect that when educators have embraced a child centered pedagogy which capitalizes on social learning practices and integration across disciplines, the site allows the collaborative practice and the learning to flourish. That being said, there is no doubt that the brilliance of architectural design companies like ThinkSpace and FNI has been the willingness to identify current educational priorities and allow them to take form in amazing educational facilities. NRI has designed educational buildings in 47 countries across 6 continents, which speaks to the reach of the profound global shifts in education which are responsive to the needs of the learner. Norma Rose Point School is in the enviable position of having both the educators and site which represent the same vision for learners. Rosa Fazio, the principal of the school, frames the vision with the OECD’s Principles of Innovative Learning. 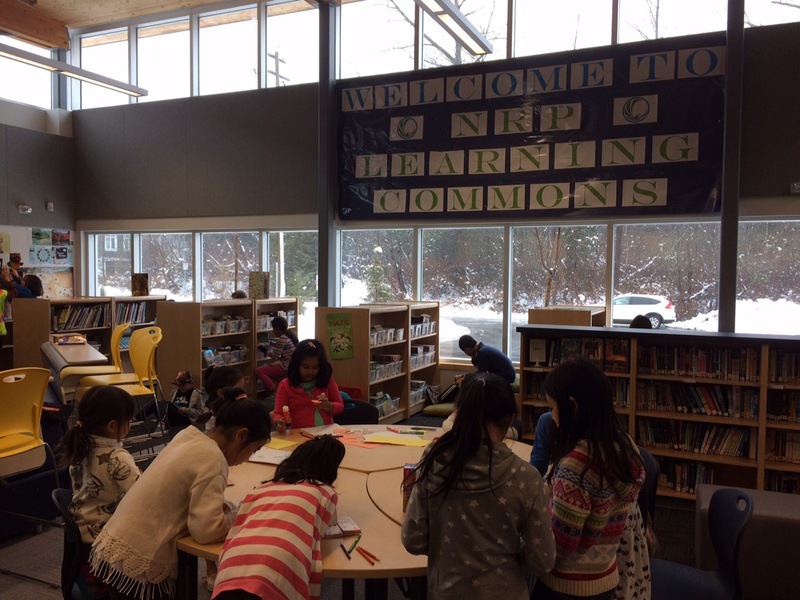 As you move through the building, you are able to see students working in several different configurations. Sometimes they are in small groups or independently developing fluency in basic literacy and numeracy skills. Sometimes they are in collaborative groups developing a project concept or problem solving around an issue. 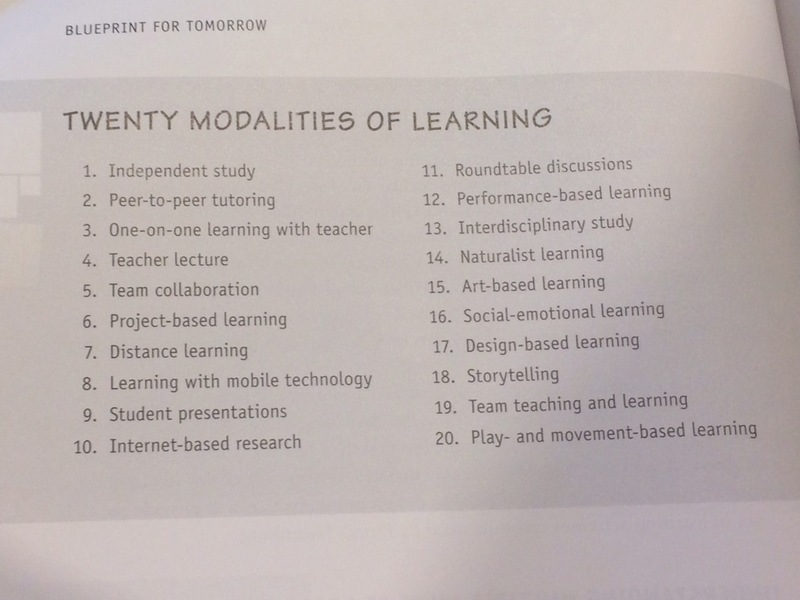 Nair outlines 20 Modalities of learning, and you can identify all of them as you move through both the K-5 and middle (6-8) school wings of the school on any given day. As a 5 year old, I experienced an environment with comfortable and diversified spaces for taking risks in my learning. My kindergarten teacher, Mrs. Hicks, understood the importance of creating a welcoming environment and planning for diversified opportunities, places and groupings to facilitate student learning. Perhaps everything I needed to know I did learn in Kindergarten. So glad this philosophy has permeated not only mainstream educational philosophy but also school design. NOTE: The Language of School Design: Design Patterns for 21st Century School by Nair, Fielding and Lackney (2013) was also excellent reading to clarify current thinking around school design. Learning our own history and the racism and miscarriages of basic human rights and justice is important. The United States has long grappled with the existence of slavery in its past and the tumultuous path of moving forward. Canada as a country has needed to step off its moral high ground and reframe our understanding of ourselves. As we grapple with the existence of the Chinese head tax, Japanese internment camps, and now residential schools that existed for the purpose of cultural genocide, how can we move forward to a place of respect and appreciation? The final presentation of the Truth and Reconciliation Commission in Ottawa was met with skepticism or hope, depending on who you are. I am a “cup is half full kind of girl” and firmly in the hope camp. I believe there is a path forward. I attended the multi-faith service that brought United, Presbyterian and Anglican leaders and congregations together at St. Andrew’s Wesley United Church. Jen was leading the children’s program and explained to the children that when Europeans first came to North America, they weren’t able to see the beauty in the people already living here. Doug White, an inspirational and articulate former Snuneymuxw chief and Nanaimo lawyer, spoke passionately about how he wanted his grandchildren to be loved unconditionally not just tolerated. Owning the tragedy and moving forward without bitterness is one face of truth and reconciliation. 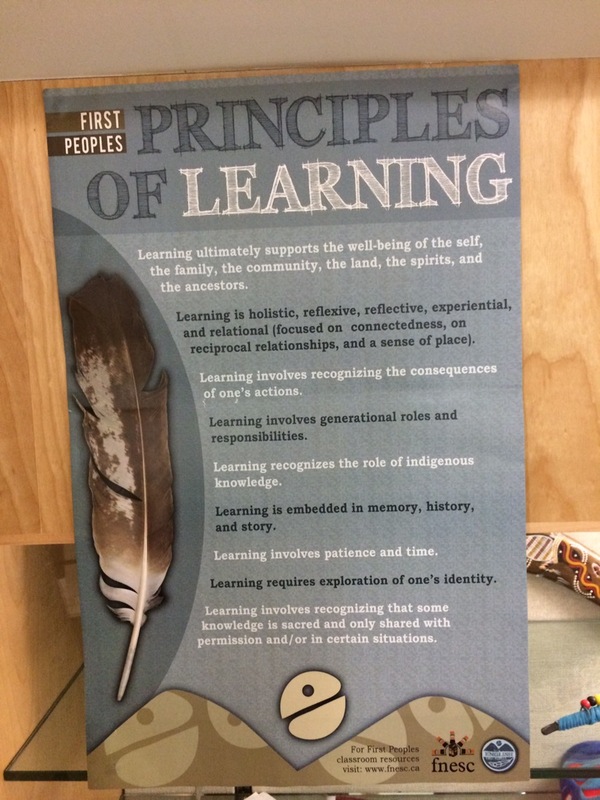 Another face is learning about and embracing our collective history and celebrating what Aboriginal people bring to the table or as Jen would frame it, “seeing the beauty in the people who were here first”. 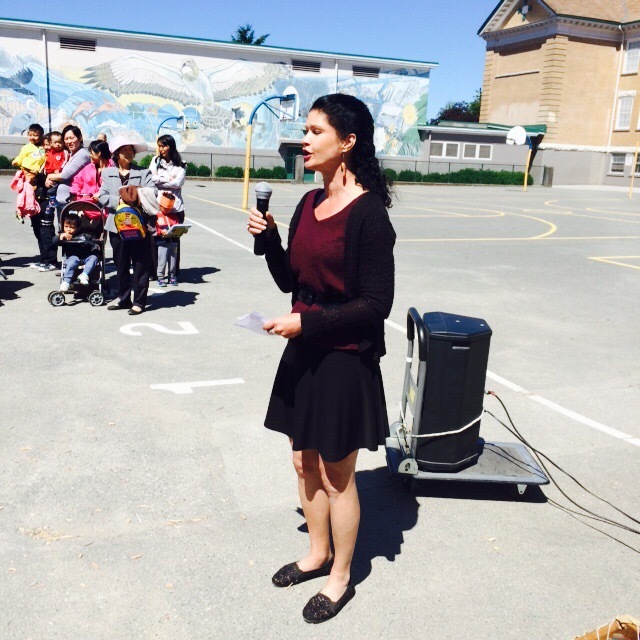 Our playground opening ceremony was a sight to behold. Our dignitaries including student leaders, parents, community build volunteers from Overwaitea, our Habitat cheerleader and preschool families took their seats. Primary students processed from the school carrying class paper chains and made a huge ring around the new primary playground ready for the honorary “paperchain cutting” by the PAC chairperson. Grade 5-7 students took their places on the field. The grade three and four students in divisions 9, 10, and 11 were the final students to process in. stories, information and artifacts made by her mom with our students as they studied the contribution and experiences of Aboriginal people in Canada. For the opening ceremony, she brought cedar boughs for the playground and led three student drummers and the students of the three final divisions in a grand procession to make another circle around the playground and primary students. They chanted the words “hosiem” and “hatchka” from the Musqueam Haikomelen dialect, honoring and providing thanks for the space. More than half of Aboriginal languages in the country reside in B.C., according to a 2010 report from the First Peoples’ Heritage, Languages and Culture Council. There are only 278 fluent speakers of all three Halkomelem dialects. Ms. Galay also spoke the words she always uses when she finishes off a sessions with our students in Dene, Cree, Ojibway and Iroquois, languages from her childhood home in Saskatchewan. 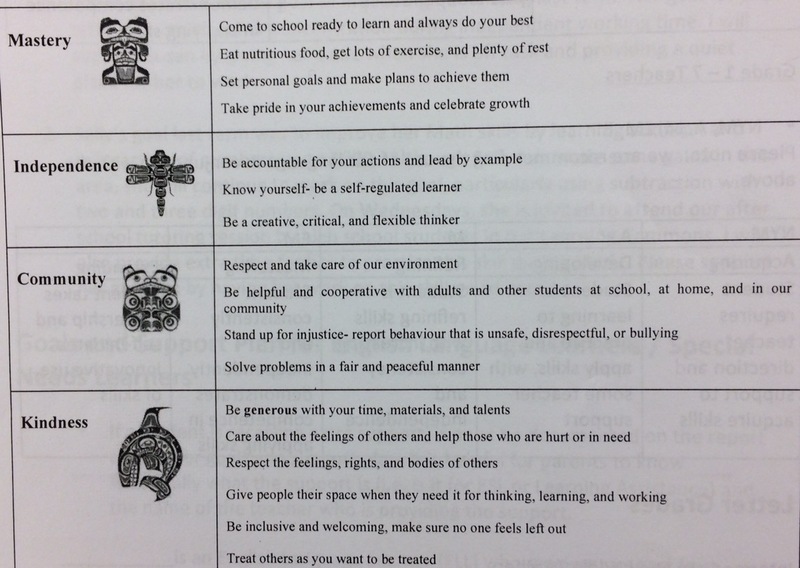 The children responded with the English version: “All our relations”. Ben followed up with the familiar and well loved poem called “And My Heart Soars”, by Chief Dan George. “The beauty of the trees…the softness of the air…the fragrance of the grass…the (view of the) summit of mountains…” did speak to us. And our hearts soared. And yes, my hope for continued truth, understanding and meaningful reconciliation grows.